It's a subject rarely discussed because it's relatively easily hidden, but hair loss is a big problem among Sikh men and covering it up doesn't take away the associated distress. Why does Hair Loss affect Sikh men more often than other men, and what can be done to alleviate it? Keeping the hair long, or kesh, is important because it makes Sikhs visible and ensures that other people can identify them. 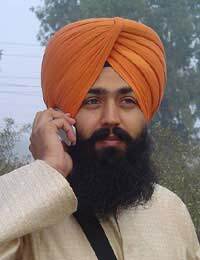 This is why most Sikhs pray regularly for their hair to remain intact throughout their lives. But the specific advice that is given to Sikhs does not state that they are obliged to have long hair, merely that they are obliged to refrain from cutting it. What this means is that, although it is good to keep the hair long, a Sikh man who loses his hair naturally should not feel ashamed. If he has not interfered with the form he was given by cutting his hair, he should try to accept what is happening to him. It is no more shameful for a Sikh man to lose his hair naturally than it is for a young man to be unable to grow a proper beard. He can still make sure he is clearly identifiable by maintaining the other outward signs of Sikhism. Although Sikh men are as susceptible to other forms of hair loss as anyone else, they commonly suffer from what is known as Traction Alopecia. This occurs when the turban pulls on the hair over time so that its roots are damaged. It is different from pulling hair out accidentally when taking the turban on or off. It is a slow process but it can be irreversible. In cases of traction alopecia, doctors will generally recommend cutting the hair short, but most Sikhs do not consider this acceptable. In fact, there are several other things you can do. Think carefully about your choice of turban. Use a light fabric and only use as much fabric as is absolutely necessary to contain the hair. The weight of extra fabric will put added strain on your hair. Be careful not to bind the turban too tightly – it's better to secure it with grips further back on the scalp if necessary, as hair is most vulnerable toward the front of the head. With practice you can do this discreetly. Be careful to position your hair directly on top of your head before you bind it. This will enable your head to support most of the weight of your hair directly when you are upright. If you tend to lean backwards when sitting, be careful to keep your head upright. Sadly, no matter what you do, traction alopecia will often cause you to lose some of the hair at the front of your scalp. But if you take care to look after your hair and bind it appropriately, you are likely to be able to keep much of the length of it at the back for most of your life. For more information on alopecia, read our features What Is Alopecia? and Can You Treat Alopecia?.